The Sunshine Coast Hinterland has way more than its fair share of creative and artistic talent. Artists of all stripes – painters, sculptors, glassworkers, wood carvers and textile artists all make their way to this secluded yet internationally-acclaimed region of Australia. Many have made the area their home, finding inspiration in the stunning Blackall Mountain Range. 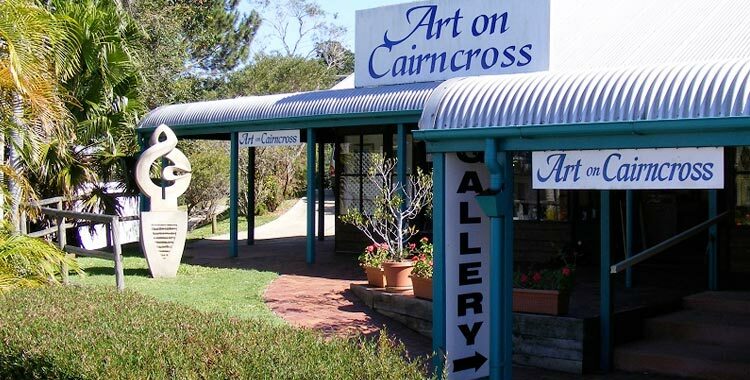 Where the artists are, so are the art fans and the towns of Maleny and Montville both have excellent reputations in Australia and overseas for their art galleries and festivals. If you’re planning a trip to the Hinterland, here’s the pick of the best galleries for you to drop into. Peace of Green gallery is an artists’ collective, staffed seven days a week by the artists themselves, all ready to provide information and insight into the works on display. The gallery hosts hand blown glass, paintings, woodwork and even leather. Illume Creations is a bright jewel on the edge of Montville. It showcases the handblown glass works of Tina Cooper, as well as scenes painted by aboriginal artists. There are also lamps, dichroic jewellery, raku pottery and many other beautiful pieces to gaze at. The gallery is open seven days a week. Art on Cairncross shows off the works of both established and emerging artists from all over Australia. It specialises in 3D art – sculpture, porcelain and even leather masks and painted silks. Many of the artists produce smaller pieces and cards to buy as gifts or souvenirs. Hosting more than 50 local artists, of all kinds, this long-established gallery focuses on a different artist each month and its website is carefully maintained so visitors know what they’ll be seeing before they walk through the doors.